In the 1950s, Dr. Norman Franz, a forestry engineer, was trying to find new ways to cut trees for lumber. He dropped heavy weights into water, forcing water through a tiny hole. He achieved short bursts of very high pressures (often many times higher than those currently used), which enabled him to cut wood and other materials. Unfortunately, he had difficulty creating continuous high pressures and never actually invented production lumber cutter; however, he proved that a focused beam of water at very high velocity had great cutting power. 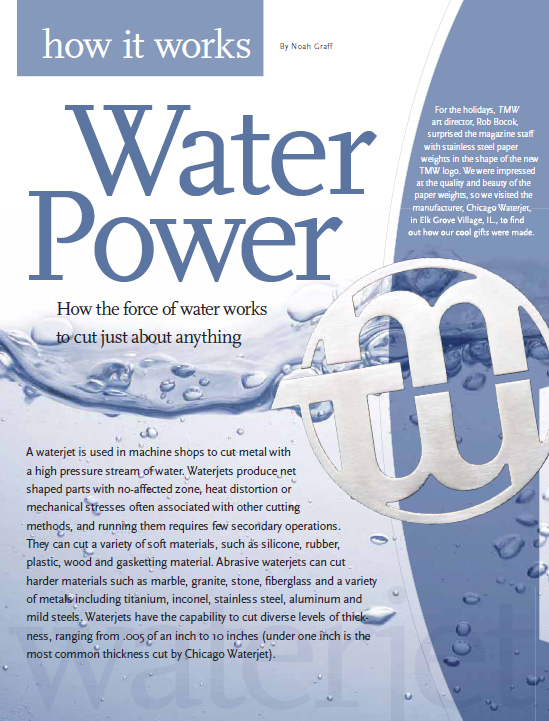 In the 1970s the first commercial use of waterjet emerged for cutting corrugated cardboard. Eventually, waterjets came to be used for cutting disposable diapers, tissue paper and automotive interiors. In the early 1980s, abrasive-waterjet was developed for cutting harder materials like metal and glass. A waterjet uses the same principle to cut through a sheet of metal as a power washer uses for getting rid of dirt and rust, but a waterjet’s stream of water is 30 times the pressure produced by a power washer. Abrasive waterjet, or abrasivejet, is used for cutting metals to produce components for a variety of functions, such as components for tool and die sets, titanium parts for the aerospace industry and customized parts for motorcycles (like the ones seen on American Chopper). For Chicago Waterjet, one of the most common jobs is roughing out IDODs (Inner diameter/outer diameter materials), which their clients can then finish turn. That way clients don’t have to saw cut out of a piece of round stock and then turn it themselves; this makes the material cheaper and the process faster. Although Chicago Waterjet produces volumes as high as 10,000 pieces, a typical job for them ranges from five to fifty pieces. Abrasivejet, which can be hundreds or even thousands of times more powerful than pure waterjet, uses water fortified with abrasive particles, generally composed of garnet, a very hard yet inexpensive stone. The water mixture is channeled through a narrow jeweled nozzle of .03-.04 diameter, at anywhere from 2,200 – 2,600 mph, with water pressure generally between 40 – 60 thousand pounds per square inch. An abrasivejet has the capability of cutting within .002 of an inch (sometimes more precisely). Unlike a pure waterjet, which cuts material with water, an abrasivejet’s water abrasive additive is what actually cuts the material. With a pump producing 55 KPSI (an average setting), an abrasivejet can cut a half inch sheet of titanium at the rate of 15 linear inches per minute. One of the biggest challenges when using a waterjet or abrasivejet is limiting taper. Typically, no matter what thickness or material one is cutting on waterjet, a taper of approximately .005-.007 of an inch per side will result. However, in recent years, an articulating head has been developed, which can reduce taper to well under .001 per side for most applications. Waterjet is also advantageous because it allows a maximum yield of any given material. Because the kerf is only .030-.040 wide, parts can be nested very closely. Also, waterjet produces no hazardous remains. The water is clean enough to go down the drain, and the abrasive substances along with the minute byproduct of the cut material (small particles) are suitable for landfill. Unfortunately, the water/garnet mixture must constantly be replaced because it is not cost effective to clean and dry the garnet, and the water is not pure enough to be reused without a purification process. The biggest drawback to manufacturing with waterjets is the maintenance the machines require. Because of the extreme stress the water pressure puts on the machinery, the pumps, seals for pumps, and nozzles all need to be rebuilt or replaced over time. Chicago Waterjet estimates that after 400 hours, they take the machines apart and rebuild them. Because they are unsure when parts will break down, there always has to be someone monitoring the machines, which means lights-out operation is impossible. However, Chicago Waterjet is able to run their machines 24 hours a day, 7 days a week. As thickness of material increases, the time needed for the waterjet cutting process increases exponentially. Chicago Waterjet advises that if the material thickness exceeds six to seven inches, it is probably best to use a different method, such as wire EDM. Wire EDM is also more accurate and better for a product’s straightness and surface finish but is significantly slower than waterjet. Chicago Waterjet admits wire EDMs are half as expensive to run as waterjets and have the advantage of lights-out machining. For Chicago Waterjet just to run the machines, the operation cost alone is almost $30.00 per hour, not including manpower. Wire EDM is limited to conductive metals, while you can cut almost anything on a waterjet, including a “sandwhich” of different materials stacked on top of each other (see image on right). Lasers are usually prefered on thinner steels (generally 3/16” to 1/4”) because of their cutting power and because one can use secondary work tables, enabling new metal sheets to slide into position almost instantly after the previous sheet is used up. Waterjets have only one work table. However, lasers cannot cut reflective metals, which makes cutting polished stainless steel a problem. Lasers also generally cannot cut aluminum because of noxious gasses that the procedure produces (unless the laser has an exhaust system). Finally, lasers produce pieces with a work hardened edge, while waterjets produce parts with smooth edges that are not heat-affected. Waterjets are often used to make lettered signs, create sculpture, remove materials inside train tunnels, cut shapes into bullet-proof glass or cut patterns in stone for floor designs. Waterjet was even utilized to cut into the hull of the submarine, Kursk, to recover the bodies of the Russian crew. If you can imagine the same machine cutting bullet-proof glass and long sheets of diapers with water, you can begin to understand what a versatile tool it is for the market today.